Larry Grenadier (double bass) Recorded December 4th and 5th 2016 at Avatar Studios, New York. Though rarely featured as a solo instrument, in the right hands, the double bass is capable of an expressive range that belies its menial role as a foundational bedrock in an orchestra or group. Of available recordings in a jazz or improvised music context several of the most important examples have already appeared in the ECM catalogue possibly as a result of the label’s founder, Manfred Eicher, being a bass player before he became a record producer, indeed it is said that this album by Larry Grenadier came about as a direct result of his prompting. 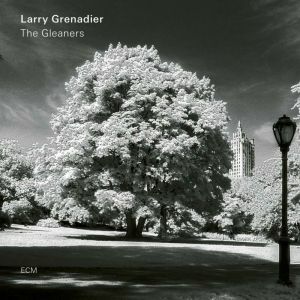 Grenadier’s contribution joins that of previous recordings by Miroslav Vitous, Dave Holland and Barre Phillips, matching their mastery of the art form with 45 minutes of multifaceted music that demonstrates both his and the instrument’s capabilities to perfection and although those who have followed his career as a charter member of the Brad Mehldau trio will feel they require no further proof, by standing alone in the full glare of our undivided attention he reveals a command of technique that may have gone un-noticed in other contexts. Of the twelve pieces in his recital, seven are his original compositions with others by his wife, the singer Rebecca Martin, fellow ECM alumnus, Wolfgang Muthspiel, a fascinating conflation of Coltrane’s `Compassion` with Paul Motian’s `The Owl of Cranston` and a Gershwin tune from `Porgy & Bess. Throughout he varies his tonal palette by playing bowed and pizzicato passages and on a couple of occasions overdubs a second plucked line to create a contrapuntal effect whilst liberally applying double-stop technique to his arco sequences to achieve enriched harmonics. If I were to single out the pieces that grabbed my attention on an initial listening I would pick `Woebegone`, which comes over as pleasingly melodic folk dance with possibly Native-American leanings, and `Pettiford`, a tribute to a great figure of modern jazz bass playing and an object lesson in manual dexterity. `Vineland`, a scherzo that takes the form of a sort of minimalist hoe-down is also notable whilst the title piece evokes the spirit of the famous painting of the same name by Jean-Francois Millet in depicting the weariness of the stooped figures engrossed in their back breaking work and perhaps alluding to the effort and attention required by the performer when turning mood into music. In his choice of material Grenadier proves to be something of a gleaner himself, indicative of a musical intelligence that is always searching for new sources of inspiration to turn into vessels for the expression of his command of an instrument that doesn’t readily yield its range of possibilities. As I said earlier it takes the `right hands` and when these are attached to a fertile imagination we can expect something special, like the music delivered in this intriguing recording.